When he’s asked about Vince Wilfork, Randy Shannon always starts with the same story. 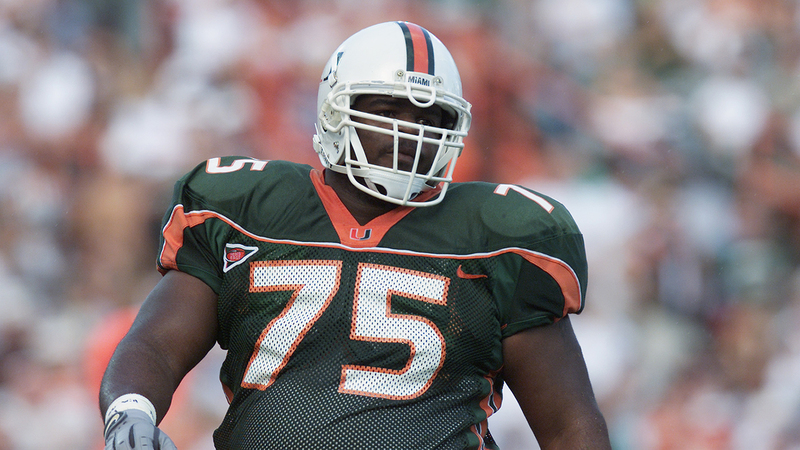 It was the fall of 2001, and Wilfork was a freshman defensive lineman at the University of Miami. The Hurricanes defense, which Shannon coordinated, was the best in the country at the time — a group that featured Ed Reed, D.J. Williams, and Jonathan Vilma, to name a few. The way Shannon tells it, Wilfork came to him early in the year, worried about how much he was playing. He was prideful, Shannon says, and not happy about his lack of chances. Later in the season, the Hurricanes traveled to Florida State for a game against the 14th-ranked Seminoles. By the 12:00 mark of the third quarter, Miami was up, 35-13, and Shannon saw an opportunity to teach a talented freshman a worthwhile lesson. 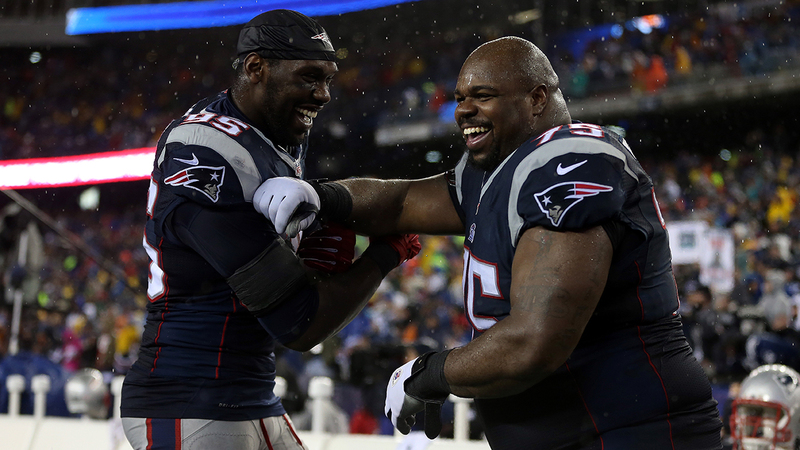 On that muggy October night, the 300-pound Wilfork played every snap of the second half. Wilfork wouldn’t have reason to complain about snaps for long. Less than two years later, Miami was building entire schemes around the body and the mind of the massive presence in the middle of its defense. “He was very good at recognizing certain things,” Shannon says. “Once you tell him something, and to watch out for something, he’s going to watch out for it, big time.” Wilfork picked up on line splits and protection calls, learning enough to figure out and tip off entire offensive game plans. During a blowout win his junior season, a pre-snap raised hand from Wilfork tipped off the rest of the defense to whether it was a run or a pass. Wilfork could tell by the chatter of the offensive linemen across from him. New England’s long-term success is mostly attributed to two men, whose names I’m sure you know. But when we look back on this era of unrivaled prosperity, Vince Wilfork should be mentioned, right along with Bill Belichick and Tom Brady. New England’s ability to evolve on offense has been easy to see. The players catching and running the ball change. Splits between rushing and passing are laid out in every box score. The shifts in the basic tenets of game plans, between this year’s AFC Championship clash and games from 2007, are clear. The Patriots’ malleability on the other side of the ball is a little tougher to notice. Chris Brown wrote about the subject prior to the last time New England played in the Super Bowl, in 2012, but the team’s defensive scheme has been hard to pin down for much of Belichick’s tenure. The 3-4 and 4-3 principles have been mixed and matched in just about every way imaginable. They’ve played with stand-up defensive ends; they’ve played with pass-rushing linebackers. They’ve played with three off linebackers, and sometimes two. Whatever the Patriots have thrown together, though, has centered on Vince Wilfork. With Wilfork at the nose, New England has existed in a world outside of defensive alignments, beyond 3-4 and 4-3. The Patriots can play each and even incorporate elements of both at the same time. The pieces around Wilfork can shift, because in the middle of it all is a player who can do anything New England asks of him. Above is a play from the Patriots’ win over the Colts from this regular season. It’s hard to even describe what New England is doing with its front. Four Patriots are at the line of scrimmage, but no traditional four-man front would dare line up this way. With Wilfork head-up on the nose, and Akeem Ayers all the way outside, there’s an inviting bubble on the right side of the defense. The Colts make the logical choice; they attack the massive opening to that side. Openings have a tendency to close when Vince Wilfork is playing. Playing two gaps like a traditional 3-4 nose tackle, he’s able to eat up both the center and right guard, while Jamie Collins knifes in to make a tackle in the backfield. Collins is just the latest New England defender whose value is derived from his ability to do it all — rush the passer, stop the run, and play in coverage. The reason the Pats can unleash him in so many ways is, in part, Vince Wilfork. 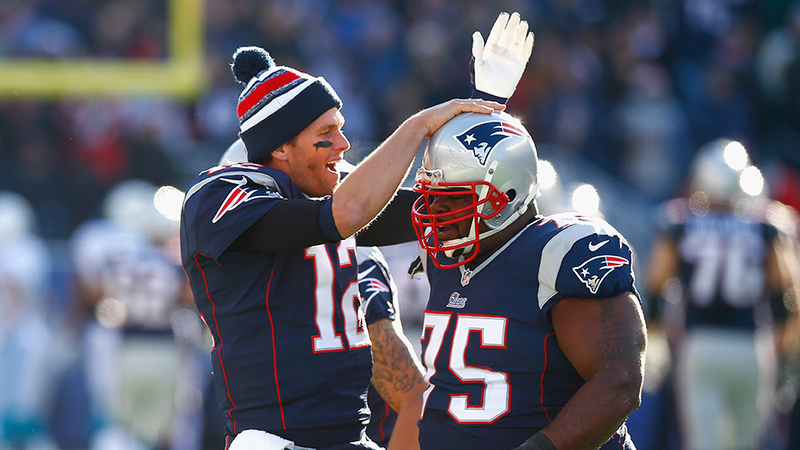 Wilfork is the rock behind the Patriots’ defensive creativity. The lockers at the University of Miami were arranged numerically, and that meant Eric Winston — no. 74 — dressed next to big no. 75. As Winston was an offensive tackle, they were rarely in that close of quarters on the field. “And thank god,” says Winston, a nine-year NFL veteran, “because he was about 320 back then, and he could move.” Winston was a year behind Wilfork at Miami. He remembers how much respect Wilfork carried around the program, but mostly, he remembers how constantly in awe he was of the big man at the locker next door. Last season, without Vince Wilfork for 13 of their final 16 games, the Patriots finished 27th in run-defense DVOA, their worst mark since 2001. With Wilfork back, they’ve jumped to 14th. For many of Wilfork’s years in New England, the Patriots defense lagged behind its offense. The defense-led teams that won the Pats Super Bowls were replaced by high-powered attacks that collected division titles and AFC Championships, but never anything more. For the first time in years, though, the Patriots defense is keeping pace with its offense, and it starts with Wilfork. “If I need to point to anybody in the room that I think needs to do it a certain way, I can just point to Vince and say, ‘You need to follow this guy’s example. This is how you sustain in the NFL,’” Patricia said this week. “‘This is how you’re a champion in the NFL.’” Wilfork doesn’t chew up and spit out entire offenses anymore, but as the Pats look for their first title since his rookie season, their defense is still built on the big man in the middle.